Yes looms can multiply. You have to be very very careful. 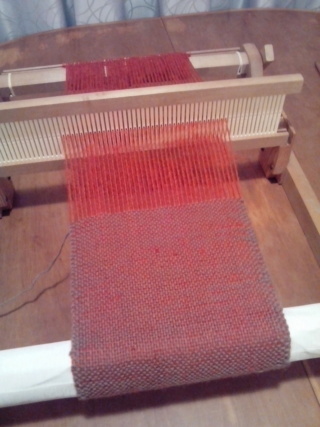 Well you should not have to retread the loom and that’s huge. Just unwind and rewinds with better/equal tension. Thanks for your understanding, NM. Yes that is what I have done and now I am hopeful of a good product. I can’t wait to see what you make Annie. I might have dropped a couple of pounds already. B: Beef stirfry on silverbeet. A stick of celery from the garden when I wandered around this morning. L: "Orange soup" - don't know all the ingredients in this, based on pumpkin and carrot. Slice of cheese. S (as lunch was small): Chocolate pancakes, peanut butter. D: Curry beef casserole (onion, carrot, jicama, tomato paste, curry powder, cornflour to thicken). Roast kumara slices. Green beans from my father-in-law's vege patch. Sounds like some good eats. Happy to hear you’ve probably dropped a few. I’m sure with all the water coming out of me, I have as well. 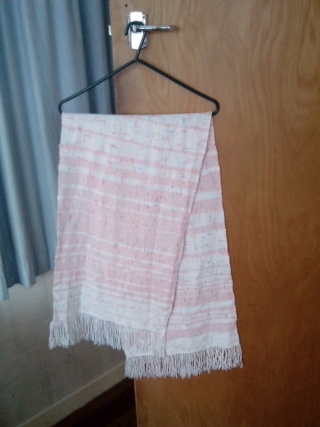 Both weaving look beautiful. Some nice additions to your scarf collection. Good to read you are still going for your loom. Sounds like fun and a calm endeavor. Your scarves are very nice indeedy. I woke up hungry. This is a good thing, I think. Motivating to keep on with wholesome primal eating today. Unfortunately, my dd also woke up hungry and she woke up first. Most of my breakfast was gone by the time I got to the fridge. B: Stalk of celery and bunch of parsley plucked from my garden on my morning walkaround. Measly spoonful of beef casserole poured over a silverbeet leaf. Obviously I will be back soon for Second Breakfast just like Frodo. 2ndB: Chocolate pancakes with butter. L: Cheesy spring veges ( leek, asparagus, cauliflower) with pepper. Apple and peanut butter. S: A few raisins. Feeling low in energy, I know I'm not eating enough, which is ok, as I have energy to burn, but need to find some carb-free alternatives. D: Butter chicken (garlic, spices, yoghurt, tomato paste, coconut cream), green beans, white rice (falling off the primal wagon already). Sorry your breakfast got snatched up Annie. Hah! Yes, first up best fed round here. L: A series of nibbles, really. Raisins. Peanut Butter. Cheese. Apple with cottage cheese. S: Ricies and banana with milk, coconut cream and cinnamon. Lindt orange chocolate bar. Peanuts. D: Marinated steak, oven baked chips, steamed carrots and minted peas. Woah, bloated tummy. I really shouldn't text while driving on windy roads, I made myself carsick and it is taking me a while to recover. We had a lovely tramp, there has been fresh snow which we were not really expecting this time of year, and we have lost fitness so it was a bit shorter than usual. It was less peaceful than usual as two blokes with chainsaws were cutting tracks in the wilderness, the sound carried up all the valleys. We have no idea why they were making inroads on a completely new piece of bush, and when we reported it at the visitor centre the staff were also unaware of this activity, which is concerning. Anyway, we hiked up, hung out at the lodge for a hot cup of tea, the cloud closed in and we hiked down again. About five hours for the day, mostly not too arduous. While my friend drove us home, I responded to a text and then wished I hadn't. DH cooked dinner, he wouldn't have got it on time otherwise. It was very tasty. Hiking snacks: Banana, pear, carrots and peanut butter, scroggin, cheese. D: Honey mustard chicken drumsticks, roast pumpkin, spiced cauliflower with lime. Hope you feel better quickly. The trip sounds great. There are many things I cannot do in a moving vehicle. Makes me sick. Bloated tummy? Do you know why? And, a 5 hour tramp does not sound like a slack on your fitness....much longer than most people accomplish. So glad you have a companion to do so. I agree, it is hard to hear chain saws going and to find out the visitor centre did not know what was going on is worrisome. Hopefully they contacted someone to check it out. Once cut...gone. Annie I hope you are feeling better today. Like the others I’d consider that 5 hour hike fantastic and great endurance. So sorry about the chainsaws. Hopefully they figured it out. Yes, it was a good hike, out for five hours and had a nice time. But we did not cover nearly as much ground as usual, and our rests were more frequent and longer. Doesn't matter, hopefully we can build up again. Tummy settled down again, it was just carsickness, I am a real wimp with that. I was bad as a child, improved somewhat when I learnt to drive, but upon getting pregnant became worse again, and am as bad as ever now. 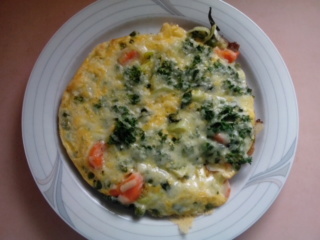 B: Vege Omelette (butter, leek, silverbeet, carrots, peas, two eggs, milk, salt, pepper, parsley and grated cheese). 'Twas almost more than I could manage. It lasted till mid afternoon. S: Hot chocolate while taking my DD out to celebrate her dance exam. Then a vegan lemon pistachio bar which was yummy. Now waiting for my bacon and apple to cook, but the bar is kicking in and I have stopped feeling hungry. L: Grilled bacon and apple slices. One week of pretty straightforward eating. More fruit and less veges than what I would think is ideal, but starting to enjoy that "lighter" feeling that comes with staying gluten free. D: Curried Sausage casserole with kumara, apple and sultanas. My dh made this, there will be some oil, and the sausages wouldn't have been gluten free (spoke to soon). Served on rice. My primal habits are tentatively returning. I turned down a chocolate biscuit tonight, they were my former favourites too! Actually, I've realised that was day eight, I'm into my second week. That came round quick. B: Grilled pear slices and bacon. Cheese slices. L: One enormous savoury muffin, with butter. So much for day nine. Rather than counting again from 1, I'll decide to call this my 20%. S: Dates and peanut butter. D: Roast pork with crackling, pumpkin, carrots, green beans and gravy. PS My meat is coming! Angus beef, he was alive and well yesterday, today getting made into steaks for me!! Annie your days doesn’t sound so bad. Beef sounds delish. B: Chow mein (onion, carrot, beef mince, cabbage and a honey soy flavour sachet, cooked in canola, unfortunately). A banana. L: Pork chipotle from the food court - Rice, beans, salad, meat cheese and corn chips. D: Roast vegetables (kumara, broccoli, cauli carrot, onion) with salami and sour cream. D: Hot chocolate and a chocolate fish. D: Stir fry onion, chicken and mixed veges with basil and parmesan pesto. Happy to hear you are being conscious of what you are eating. That’s always a good step. Yes, it is key to keeping on top of things. We are away at the moment, so have to do with what is possible in the time and facilities available, but hasn't been too bad overall. My eldest DD is eating vegan at the moment, it is very limiting. The food court was a great option as there was something to appeal to us all, as was the Indian place. There is ability to cook here but we have been busy so it had to be super quick and something I could leave meat and dairy out of. Pretty challenging for me as I usually start there and build the meal around the meat. Also, canola was the only fat available. Eating out has made me very thirsty. I usually add what I think is quite a bit of salt to my meals, but it must still be a lot less than what is in commercial food or that flavour sachet I used the other night. We have seen 52 tap dancers perform twice each, plus the 12 semi finalists and six finalists perform again. It was amazing, but also draining. I caught only a few pianists in their section, wow those young people have spent hours and hours on their instrument. fRom the sound they get out of it I could hardly believe they only own two hands! Beautiful. Sounds like a good time Annie!